Russell Crowe (l.) and Mark Wahlberg talk it over in Broken City. Mark Wahlberg (Ted), Russell Crowe (The Next Three Days) and Catherine Zeta-Jones (Rock of Ages) star in the 2013 crime drama-thriller film Broken City. Seven years after he was forced to retire from the NYPD in disgrace, ex-cop Billy Taggart (Wahlberg) works as a private detective and finds himself in over his head when he agrees to help out the mayor of New York City (Crowe). Hizzoner enlists Taggart to trail his wife Cathleen (Zeta-Jones) to see if she’s cheating. Along the way, Taggart, realizes that the mayor’s motives run deeper than expected and he needs to take the fight to his opponents and navigate his way through a web of lies and deception that puts his freedom–and life–on the line. Directed by Allen Hughes (one-half of the filmmaking Hughes Brothers of Dead Presidents and Book of Eli fame), the film co-stars Jeffrey Wright (Extremely Loud and Incredibly Close), Barry Pepper (Snitch) and Kyle Chandler (Zero Dark Thirty). 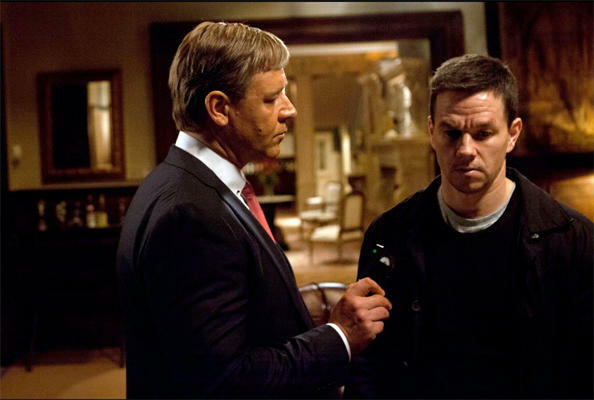 Received generally less-than-sterling notices from the critics—it averaged a 4.8/10 at Rotten Tomatoes based on 141 published reviews–the R-rated Broken City rang up some $20 million at the box office during its wide release to U.S. theaters in January, 2013.